The cool autumn morning air swirled into the truck as I rolled down the country road with my window down listening to John Anderson “Seminole Wind”. It was still dark out and I had planned to drive out and arrive at the farm just before sunlight to have an edge on the ducks, hares and grouse. At dawn they might still be moving about looking for food. As I got closer to the farm, I turned off the radio and could now only hear my tires on the gravel road along with a few song birds. I took my foot off the gas pedal to slow down without breaking and then turned up the main road to the barn. By the time I unhooked the electrical fence and drove up the lane way to park the vehicle at the top of the ridge my friend was already outside ready to greet me. We had a hot cup of coffee, and then chatted away about the local news. The sky was pink now and the rock doves were flying just a few feet above us heading south dancing in the wind. To the west a rafter of eastern wild turkeys were playing around in the fresh cow dung looking for seeds, actually they were pretty close to the cattle but that did not seem to bother the young bulls too much. It was going to be a perfect day with a mixture of sun and cloud, maybe even slight rain but that kind of weather is great for ducks and the temperature was sitting at about thirteen degrees Celsius. On my way in, I had been preparing myself mentally for the approach and having a good hunt, not focusing too much on what I was going to harvest but rather just try to enjoy this time I was going to have alone through the trails in the woods and along the creek. The fall colors were brilliant, bright reds and yellows surrounded you with the forest just glistening with diamond like light flashes as the water seeped through the cracks of the leaves, rocks and deadfall on the forest floor. I had decided to start off the morning with grouse, heading west toward higher ground and following some of the trails up to the top of the hill through the woods. So, I packed up the truck put on my gear grabbed a few shells along with my 870 and cut across the western hay-field. The panoramic view at the top of the hill was stunning and offered a full view of the two southern hay fields where the cattle herd was gathered, the creek running west to east and then the swamp. When hunting grouse I find that the still-hunting method works best for me; essentially I am walking-up the grouse both to get them to burst into flight or get them to drum, so that you can spot them and shoot. Sometimes if you get lucky you can see them sitting high on a stump or just off to the side of the trail near the forest floor just meters in front of you. If this should happen to you don’t try to get up too close in which case you will scare them into flight and render your shot a difficult one. Try to take the shot from where you’re standing and avoid fast movements. It sometimes depends on which kind of shotgun shell shot you use and how far you are from the bird. # 6 works well for me and I have harvested grouse that were a fair distance away. Still-hunting requires a lot of focus and careful stalking, which in my case is very slow walking through jagged rocks and deadfall that are hidden under the leaves. It can be slippery and at times dangerous for your ankles. So, after a nice hike through the trails, I decided to turn south and head through the woods down to the creek and follow it back to the barns to the east and try to harvest some rock doves. The descent was steep, so I unloaded my shotgun and moved my way down the side of the ridge sometimes pushing up against trees so I would not fall over. By the time I got to the edge of the creek, I reloaded my shotgun with some #2 shells and started to walk leisurely to the east through some tall grass and over the beaten down mud trail that the cattle used to navigate back and forth between the fields. This part of the creek was wider and you most definitely needed waist-high waders to go through the water, so I chose to stay on the northern side. I had to pull my boots out of thick mud several times and make sure that I stepped on solid ground to avoid falling over. My boots once removed from the muck would release the swamp gas odor into the air. I started to still-hunt again now that I was closer to the wider part of the creek and further away from the tall grass. I was scanning all around with my 870 at the ready in my shoulder looking into the small brush piles along the sides of the creek, I had only taken four more steps when all of a sudden a “Splash” sound came from my right, I turned my head and saw two black objects shoot up from the water and burst into flight towards the west. I swung my body around one hundred and eighty degrees and identified them as two mallard ducks; I instinctively chose the bird to my right as I was taught. When there are several birds, pick only one out of the group and focus on it for the shot and if you are fast enough then aim for another. The one on my right was closer. The duck was about fifteen yards away now and about four feet from the ground; I pushed my safety catch off and fired a single shot of #2 into the bird. The duck turned upside down and the wings seem to freeze and the duck fell down to the ground. The mallard flapped its wings a few more times and then lay still. I put my 870 on safe, ran over to the duck and hooked it onto my belt and headed back to the truck. I made my way east a little further along the edge of the creek in case there were more ducks and turned north toward the truck. At the truck I unlocked the tailgate and laid my gear down along with the mallard and had another chat with my friend. A few minutes had gone by and I was getting ready to head home and call it a morning. 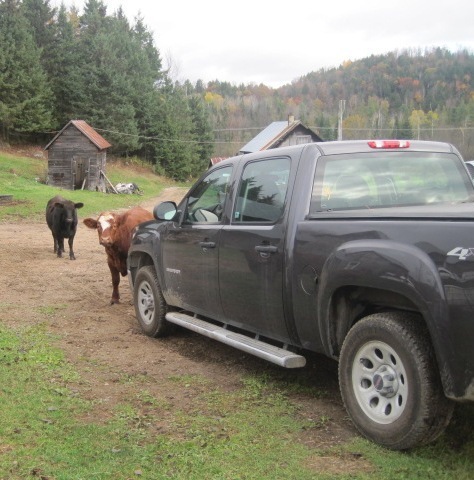 There were three curious cows that came to the front of the truck not far from where we were standing, one of them began licking the headlight on the driver side. This made us laugh as we continued to talk, when all of sudden my friend yelled out and ran frantically over to his tractor which began to smoke. There had been an electrical short in the wiring and there were flames coming from the motor. I ran over as well and noticed that the flames and smoke were intensifying. We fought the fire for what seemed to be only a few seconds and had it out fairly quickly, allowing us to detach the battery connections. I suppose then that being in the right place at the right time applies to hunting and farming too.